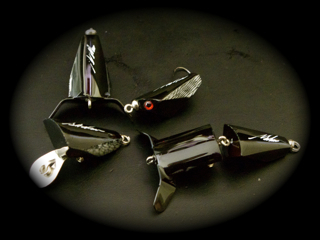 Nutterjuck Bass baits have been tweaked. This tweaking now includes Wake Bait, Walker, Joined Walker. Fizz, Pop and the cheaky Pop/slider These new styles will be available in Black Knight or White ghost, Black Flock, Black Marble and White Marble (read more). We are proud to anounce the release of the new Codmotion. As the name applies, this lure will make a racket on the surface. 100mm long and weighing in at 30g. 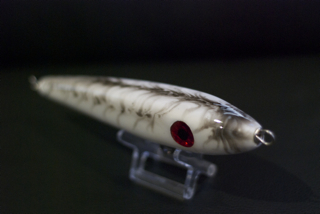 The all Australian handcrafted timber Cod lure. Nutterjuck stick baits (marbled). These are 160mm long and weigh 80g, Each lure is rigged with 1.6mm wire and a 5/0 NT power swivel. 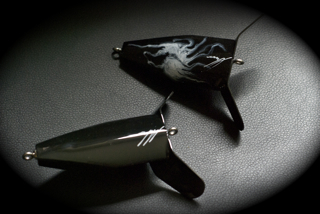 These are hand carved and hand painted, each lure is different. concrete5 - open source CMS © 2019 Nutterjuck Lures.